The trees in the orchard were covered with ripe, juicy oranges that were nearly as big as melons. Zhang-Wu walked among them. The fragrance of the citrus fruits made it nearly impossible to resist picking one. Zhang-Wu looked on the branches for the largest orange. "I see the perfect orange," he said, but frowned when he realized it was dangling from one of the highest branch. "How am I going to reach it?" Zhang-We looked down the rows of trees. He spotted a ladder leaning against one of the trees. Slowly, he dragged it over and leaned it against the trunk. He climbed up and pulled the big orange off the branch. He sniffed it. "Hmmm, it smells delicious." Just as he was about to peel the thick skin off, his brother, Yang-Chen came running towards him. "Zhang-Hu, what are you doing?" he asked. "You know Father doesn’t like us to eat the oranges. We need to sell them." "I know, Yang-Chen. Why don’t you sit with me and we’ll share it. Smell it," he urged, putting the orange in front of Yang-Chen’s nose. "It’s very fragrant. I’ll have some, but only one orange. That’s all," Yang-Chen cautioned. Zhang-Hu peeled the orange. He broke it in half. "Say, Yang-Chen, how many seeds do you think are in my half of the orange?" "How many do you think are in mine?" Yang-Chen returned. "If I guess the right amount, can we pick another orange?" Zhang-Hu asked. "Father will be angry with us. If I win, then we don’t pick another orange," he replied. "I will guess that you have six seeds in yours," Zhang-Hu guessed. "I will guess that you have seven seeds in yours," Yang-Chen answered. They each pulled a section off their orange halves. Juice squirted out and ran down their fingers. Yang-Chen licked the sticky juice off and popped the section into his mouth. Soon he spit out a seed. "Here is one." Zhang-Hu put two sections into his mouth. Juice squirted everywhere and ran down his mouth onto his shirt. He soon spit three seeds into his hand. "I have three in one section, Yang-Chen. I have five sections. Do you think I’ll only get four more seeds?" he smiled. Yang-Chen ignored him and ate his orange. When he finished, he counted seven seeds. He didn’t tell Zhang-Hu. He just folded them in his fist and held them until Zhang-Hu was finished with his orange. Zhang-Hu kept spitting seeds out. By the time he was finished, he had fifteen seeds in the palm of his hand. "You guessed wrong," he laughed at his brother. "You guessed wrong too," Yang-Chen smiled back. 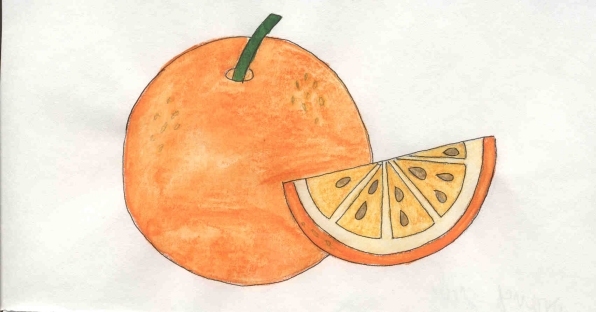 "Since we both were wrong, then I can chose if I want another orange or not," Zhang-Hu said. "I want another." He jumped up and began to climb the ladder. Just then the boys father, Chen-Li, walked up. "What are you doing up in the orange tree?" Chen-Li asked his son. He looked over at Yang-Chen, who lowered his head in shame. Zhang-Hu looked down. "I am just checking the oranges for bugs, Father." "Climb down here," Chen-Li commanded his son. Zhang-Hu did as he was told. When he jumped off the ladder, Chen-Li noticed the orange juice stains on Zhang-Hu’s shirt. Knowing Yang-Chen wouldn’t lie to him, Chen-Li looked directly at him and asked, "Did you eat an orange?" "Yes, Father. Zhang-Hu picked it and we shared it. We wanted to see how many seeds were in it." "Oh. I see. And how many seeds were in the orange?" he asked Zhang-Hu. "I had fifteen and Yang-Chen had seven. That makes 22 seeds," he answered. "Then for 22 days you have to work in the orchard. Every morning you will come out here and weed and water the trees," Chen-Li scolded. "Yes, Father," the boys replied. For the next 22 days they worked very hard. Their father kept a close eye on them. He wanted to teach them obedience. Never again did they pick another orange. They waited for their father to offer them one, which he did quite often. After the 22 days had passed, the boys ran off to play. They had learned a valuable lesson that day in the orange orchard.